Apple has a big chal­lenge. And, even if you don’t use Apple prod­ucts, you and your com­pa­ny have a prob­lem, too. You see, find­ing your next is not an option. That is one of the core mes­sages in my most recent e-book, announced last week [link]. One rea­son, per­haps, that Faber and oth­ers believe what they do is that Apple has yet to put for­ward a gen­uine game-chang­ing con­cept of tele­vi­sion. It has, say many, been sit­ting on old ideas too long. What hap­pens, some say, when every­one who’s going to buy an iPhone or an iPad (Apple’s two largest prod­uct lines by sales) has done so? Can Apple sur­vive main­ly by peo­ple upgrad­ing what they already own? Not like­ly. Thus, the grow­ing din for a new Apple TV, not the com­put­er-to-TV appli­ance it now sells. Before Steve Jobs died, he had a vision of an inte­grat­ed tele­vi­sion set, and he told biog­ra­ph­er Wal­ter Isaac­son he had “final­ly cracked it.” Two years lat­er, Apple has added a few apps to the Apple TV, but there’s still no iTV, no stream­ing sub­scrip­tion, and no vis­i­ble plan to upend the cable busi­ness. So far, Net­flix appears to be clos­er to upend­ing the TV mar­ket. I just spot­ted an inter­view on Bloomberg TV between host Emi­ly Chang and Sur­vey­Mon­key CEO Dave Gold­berg. The sub­ject: “Has Apple Lost Its Cool Fac­tor?” [link] But just go to YouTube and type that ques­tion in and you will find many ask­ing the same ques­tion in many dif­fer­ent ways. Apple has been ‘pulling the string’ on the Apple TV for sev­en years now. Think about that one for a minute: it’s had a set-top box since before the iPhone. Dur­ing that time, the land­scape of online video enter­tain­ment has com­plete­ly changed, large­ly as a result of the iPhone, iPad and iTunes Store. While Apple has a long way to go in order to make the Apple TV a decent solu­tion for coun­tries out­side of the US, it has made some progress and con­tin­ues to very slow­ly iter­ate on the orig­i­nal premise of an in-home media stream­ing device. A large part of that is iCloud, which now allows users to watch any pur­chas­es they’ve made from iTunes on any device, includ­ing ATV. But there’s still a lot of work to be done if the device is going to become a major pil­lar of Apple’s busi­ness, as I believe that it could be — and should be if cards are played right. Peter Bur­rows and Andy Fixmer have report­ed that “Apple Said Devel­op­ing Ad-Skip­ping as Part of TV Strat­e­gy” [link]. Patrick Seitz (@IBD_PSeitz) report­ed that at least one indus­try ana­lyst thinks the new TV will be con­trolled by users wear­ing a ring on their fin­gers [link]. And Zach Epstein (@zacharye) expands on anoth­er analyst’s views and details many ways that the new Apple TV could “rev­o­lu­tionise” what it means to watch tele­vi­sion [link]. I could go on and tell you about MIT Tech­nol­o­gy Review and its dec­la­ra­tion that “Tele­vi­sion view­ers [still] fum­ble with awk­ward remote con­trols and crave a rich­er array of on-demand pro­gram­ming. 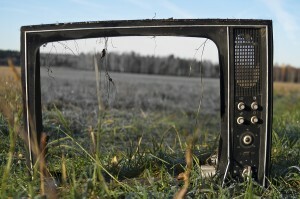 It’s time for Apple to step in and dis­rupt the TV busi­ness” [link]. Or I could men­tion Richard Waters on FT.com stat­ing that “Apple must plant its flag in liv­ing room” [link]. Or send you to Bri­an Stel­ter in The New York Times who reports that Apple appears to be link­ing arms with many oth­er indus­try lead­ers to cre­ate a TV expe­ri­ence that is unri­valled [link]. I have asked my team of NextSen­sors [link] to con­sid­er the look and feel of the future of Apple TV, and we will pub­lish some of their views right here in the com­ing weeks. Who will win the race to invent the “next” TV is uncer­tain. What is cer­tain is that Apple’s cur­rent CEO, Tim Cook, and his top team [link] must realise that find­ing Apple’s next is not an option. Please dit­to that for you and your own com­pa­ny.